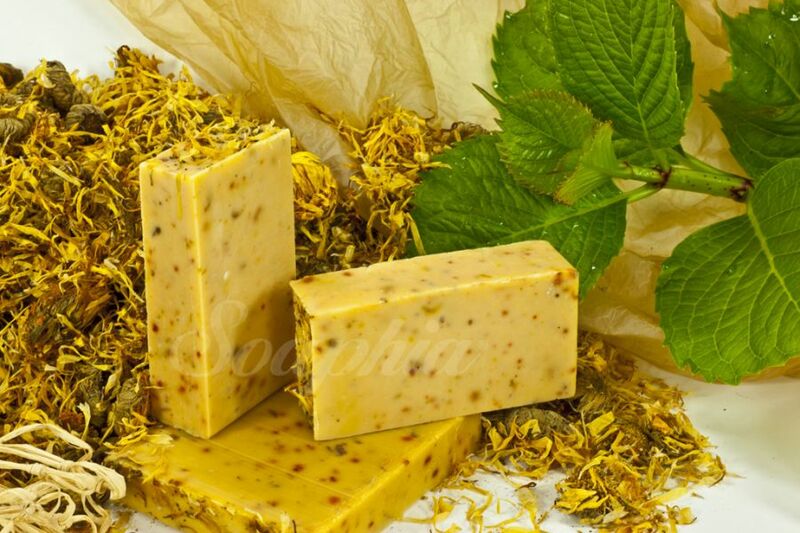 This soap is decorated with beautiful Marigold petals and fragranced naturally with essential oils of Orange, Patchouli, Tagetes, Orange Blossom, Petitgrain and Rose Geranium. Tagetes oil is extracted from the leaves, stalks and flowers, picked when the seeds are just starting to form. The therapeutic properties of Tagetes oil are anti-infectious, anti-microbial, antibiotic, anti-spasmodic, anti-parasitic, antiseptic, insecticide and sedative. It has a beneficial effect on fungal and microbial infections. It is a very healing, therapeutic soap that will bring the sunshine into your washing routine whilst gently cleansing and deodorising the skin, helping to correct any skin disorders and impurities. Suitable for all skin types, a very gentle, healing and soothing soap bar. Also makes a good insect repellant. Excellent general purpose toilet bar.